This pen and ink drawing by 'E.Pitt' was produced as a commercial postcard in 1915 by an unknown publisher. It shows an overcrowded LCC tram with people (all men) still fighting to get on board as it tries to depart. There is a certain amount of mystery surrounding what it is all about but let's analyse what we can see. The side of the tram is emblazoned with the exhortation "Travel by Tram 40". This would appear to refer to LCC tram route 40 which, by 1915 when the drawing was made, had been running from Victoria Embankment in Central London, via Camberwell, New Cross, Greenwich and Woolwich to Abbey Wood, since April 1914. Apart from being used for commuting to and from Central London, the route also passed Woolwich Arsenal, a major employer at the time of the First World War. The caption at the bottom reads "Try a Joy Ride [Twice Daily] Only One Price 4D - Sundays Extra". 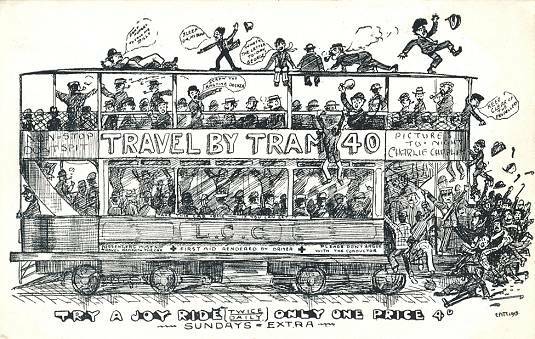 The cartoon is certainly sarcastic in tone and is probably a comment on the overcrowding of service 40 at the time when the fare between (say) Woolwich and Central London was 4d. (in old money of course). There are various comments written on the tram: "Non-Stop, Don't Spit", "Take this car home - if you can get it", "Passengers must not travel beneath the car", "First Aid Rendered by the Driver" and "Please don't argue with the conductor"; there is also an advertisement, "Pictures To-night - Charlie Chaplin". Some of the passengers have 'speech bubbles' saying: "Sleep on McDuff", "Don't forget to call me, Bill" (a wake-up call because the character is in repose on the roof) and "Keep clear of the propellers". There are two other comments whose true meanings appear to have been lost over the past 102 years; "What's the letter today, George?" and, intriguingly, "Screw the ragtime docker". The tram itself is not an accurate representation of any specific LCC car type although most closely resembles a Class A or Class D bogie car, part-modernised with an open-balcony top cover but retaining the original reversed stairs. A few were still in this state in 1914-15. The drawing does not include a trolley pole so, being equipped only for conduit operation, it must represent the tram operating from Woolwich westwards. (There was a plough 'change-pit' at Woolwich so that the rest of the journey to Abbey Wood further east was run with a trolley pole). However, this could all be 'artistic license' with the drawing reflecting the artist's personal experience. This is not an especially rare picture postcard but, over 100 years after publication, it still retains some mystery.